Oooh! I finally get to put my Caracole tulip to good use! Ah, and such good use it's starting out to be! Pours a beautiful deep amber/brown that still manages to be fairly clear. Medium-high head that's a dark cream color. Very tight bubbles that just do not go away. Smells wonderfully of malts! Malts! Malts! Raisin, caramel, bread, earth, sun, moon! No, wait, I'm getting carried away... Tastes like malts, man. Caramel, raisin, bread, earthy. Gently sweet and on the thicker side. Hey, if I had this on tap it'd be my every-day beer. But at 9.5% (which, hey, you can't even detect) a 750ml bottle is way more than too much for one person on any one evening! Purchased this at a local shop in Freiburg. Also my first time having anything from this brewery. Poured from fridge temp (maybe slightly warmer). Pours a nice dark brown with strong head that quickly dissipated. The nose is really nice - I'm getting a good about of plum and raisin, along with some bready notes. Taste is really nice - surprisingly strong with almost a licorice bite upfront. Very different from other Belgian dark ales, and definitely not in a bad way. Taste is really full and complex, with raisin, fig, plum, and toffee. Slight bitterness on the back end that lingers for a minute. Nicely balanced with a good creamy mouthfeel. Overall a wonderful offering from this brewery. I will definitely seek this one out again. Burnt by the fire in the year 66". Gorgeous, burnished copper-orange-red with bright orange peel trim. 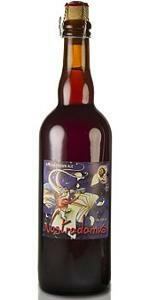 Nostradamus looks like a barleywine. The head is golden ecru in color (good) and is nearly featureless as it deflates (not so good). Although there's no lace, the fantastic color of the beer makes up for it. The nose is unquestionably good, but I can't quite bring myself to bestow greatness upon it. Dark caramel and toffee share center stage. Also noted is a generous quantity of mellow, dark rum-soaked fruit. It isn't as spicy as some BSDAs, but I'm okay with that. I love the flavor. My hope was that it would be a more explosive version of the nose... and that's exactly what it is. Like the nose, the flavor is dominated by figs and dates macerated in the finest dark rum. It also has an oaky character that puts me in mind of some of the heartier bourbons. There's so much fruit flavor (plums in that sip!) that the beer is almost port wine-like. Spice still takes a back seat, but there's now an understand clove spiciness that adds character. All of the various members of the flavor profile meld into a beautiful, seamless whole. A remarkable achievement and a remarkable beer. I was initially disappointed in the mouthfeel since I felt it was too light and too carbonated. It didn't take long, though, for both of those faults to be remedied. At the halfway point of the bottle, I'm becoming more and more impressed by the medium-full, well mannered, but still lively beer that greets my every sip. Given my enjoyment of the only other Brasserie Caracole beers that I've had prior to today (Ambree and Saxo), I prophesized that Nostradamus would be to my liking. I'm impressed by this delicious BSDA and have no problem recommending it to anyone who likes great beer. Poured a dull hazy brown with a great tan head that stuck around for a good while and left decent lacing. Aroma is a very pleasant yeasty, doughy and malty presence with mild fruits, raisin being the first that comes to mind. Very mild hops if any. The flavor was of mild spice, raisin, some malt and yeast, but faded quickly and didn't give much besides what I've already mentioned. I will say the very high ABV was well-disguised and not overpowering at all. The feel was pretty disappointing; the sweetness fades quickly into a mild tart or sour feel, then fades more into a watery and bland experience I don't expect from Belgian browns. Very drinkable, but the question is do you want to drink an entire one of these? A glass is worth having, and definitely a nice warmer on a cold autumn night, but there are better choices in the genre. Pours a dark brown with a fizzy off-white head. The head dissipates rather quickly and leaves no lacing. The smell is ripe with raisins, dates, purple grapes, wine tones, brownie, and just overall sweet dark fruit flavors. The taste is similar, a malt bomb filled with every dark fruit flavor under the sun. There is some more caramel and toffe in the taste as well as a hint of coffee. This one is heavy and alcoholic, but it provides an array of malt flavors perhaps unmatched by any other brew. It is complex but a bit too sweet and alcoholic but overall a solid brew. Aroma: Unfortunately this fall in Houston is bad for those of us with allergies, so my senses aren't what they should be. I get noticeable alcohol along with some assertive plum/raisin aromas. There is a noticeable spiciness here that I don't know if it is from an actual spice addition or from reactions with the alcohol. As the head falls a bit, there is much more earthy and malty aromas coming out. Taste: The taste is pretty much in line with the aroma. Some sweet malts along with some roasty ones are a big part of the flavor. Some raisin and a bit of spiciness is the most notable in the beginning. The middle of the flavor profile gives way almost entirely to the malty sweetness, along with a subtle floral presence. The finish is slightly resiny, but the carbonation makes it come across as more dry. Long into the finish, there is a noticeable alcoholic warmth that lasts the whole way down. Opinion: I think that this is a pretty good beer, and one that I would definitely like to try again. I got a hold of a bad bottle of Ambree, so I had an eyebrow raised when I cracked this one open. I was pleasantly surprised. The alcohols are a little more noticeable in this beer as I would like, but you can't win them all. It is still a very approachable brew. Got a bottle for $8.50 at Abe's Cold Beer. This reminded me a bit of the dark Unibroue's for the rich grape and date flavor. This beer drinks a little thinner, however, with a mellow, earthy/dirty spice aftertaste. It is on the sweet side, but it's fairly balanced and reasonably drinkable for the strength. The aroma was a touch weak, but still full of those pleasant fruit and herbal elements. I'd say this one is worth a try. I had this beer on tap at Melton's App & Tap in Decatur, GA. It was poured in a small Caracole tulip glass. Appearance: The color is an opaque auburn/brown with a dense tan head that slowly dissipated into a thin layer. This beer produces decent lacing. Smell: The aroma is of fermented, aged, or dried fruit like apples , raisins, dates, etc. This scent is shared with a yeasty malt smell. Taste: malty with light spices and deep aged fruit flavor. Mouthfeel: Medium with light carbonation. Drinkability: The flavor is very pleasant and complex. A: The pour is hazy copper with a rich large off-white head that stays for a long time before it dissipates, leaving lots of lace. S: Alcohol hits your nose at first. Then there's almost a sherry-like-smell. Lots of different fruits: dark dried one (raisins), but also raspberries and fresh dark cherries (like the ones they use in Kriek). Spicy and complex. T: Sour and dry, like an Gueuze without brett. Lots of fruit; dark cherries, dark dried fruits, raspberries (just before they're fully ripe). Alcohol is present, but a bit more laid back than in the smell. Spicy. M: The aftertaste last forever (almost), with dry bitterness. The body is full and the carbonation is medium. An obvious warmth from the alcohol. D: A very complex beer. Some of the parts in it are the greatest ever, still other parts are a bit to much... They could have hold back a bit on the alcohol. But overall: If you get your hands on it, you clearly must buy at least one bottle. Poured into a Delirium tulip a dark ruby brown color and a thick two finger head. Head falls quickly into a blanket of foam on top of beer and decent lacing. Small peices of sediment from the glass can be seen clinging to the side of the glass. Aroma is great! Raisons, dark cherries, figs, malts, spicy yeast esters, sugar, and a faint whif of alcohol. Flavor is very nice, much drier than the nose leads on though. Chocolate, dark overripe fruits, and malt are prevalent, with a slightly hoppy/roasted finish. Very nice over all. Mouthfeel is chewy and silky. Nice level of carbonation to scrub the tongue, and flavor lingers well. Drinkability is good given the alcohol pecentage. First try of this brewery. Brown, clear brew with a thin head. Smell: banana. very distinct banana. After that malt, dark fruits, herbs come through. Taste is malty, with hints of coffee and chocolate. Also fruits and herbs, hops. It's well balanced. The drink has a very friendly character. It's not too robust for the stout notes it has, but also not too weak for the fruits that come through. It's rather modest. It could do with some more wild flavours, but all in all a very nice drink. A murky, brown, dark copper beer with a thin head and a lot of yeast flakes. Smell is caramel malty, with fruity, almost exotic fruit notes. A yeasty smell which probably comes from the yeast flakes.Some alcohol whiffs. Taste is light bitter with a nice candisugar, caramel taste. Some alcoholic whiffs. A spicy taste that appear to be coriander and clove, or at least that's how it tastes. A nice rounding maltbitterness. To me a pretty standard Belgian beer, but that doesn't make it any less. Had this in Mid March on tap at Blue Monk. A: Pours a dark opaque crimson and brown color with a nice ring of off white fluffy head. Little to no lacing. S: Smell has a bouquet of sugar coated dark fruits and prune notes. Brown sugar, a little tartness, caramel malt and more in the nose. Pleasant. T: Taste has a lot of confectionary quality to it, like a big fruit pie with brown sugar on top. Pie crust with plum and red grape. I certainly get the Trappist yeast and even an old school licorice flavor with butterscotch to boat. Very rich. M: Ample carbonation and nice slick feel, though thinner than I had anticipated. Little to no alcohol presence. O: A Nice beer I'll look to get again. also a little sour and fruity. The mouthfeel is very full, but not chewy. This is a very delicious beer, I find it quite drinkable and highly recommend it! Nice looking Belgian! Pours a hazy brown with reddish highlights into my Chimay goblet. Nice size white carbonated head that holds its own for a while despite the 9.5 abv. Leaves a sheeting type covering (I wouldn't call it lacing) on the glass when you tilt the beer up to drink. Aroma is fairly mild for a Belgian. Some spiciness and fruit and a little alcohol. Tastes good: spices (coriander?) Belgian candi sugar, caramel malt and raisins/plums. The alcohol is a hair too heavy but still not bad. Mouthfeel is ok...a little richer and more tongue coating and a little less alcohol burn would be appreciated but it was good enough anyway.